The D8000 series USB interface modules are a family of complete data acquisition modules for use in process control systems. The analog input models can measure process signals such as thermocouples, 4 to 20 mA current loops, and discrete contact closures. The analog output models can generate voltage or current signals for controlling annunciators or valves. The digital input and output models can sense the state of remote digital signals or control solid state relays. Complete data acquisition systems can be created with ease with the D8000 modules and a host computer. The modules provide direct connection to a wide variety of sensors and annunciators such as thermocouple probes, 4 to 20 mA loops, and DC voltage. They perform all signal conditioning, linearization and contain no internal pots or DIP switches. All user-selectable features such as ranges, communications settings are stored in nonvolatile EEPROM, which maintains these values even after power is removed. The D8000 series USB interface modules connect to a host computer using a USB interface cable and they communicate using a virtual serial communications port using the Modbus RTU protocol. Use a USB cable to connect the D8000 to a host computer. Plugging the cable into the computer will create a virtual serial port in the computer. The virtual serial port will be used by the host to communicate with the module. Serial communication ports are supported by almost all data acquisition and process control programs in the marketplace. The Modbus RTU protocol is used to read and write data values to the D8000 series modules. The Modbus RTU protocol is a serial protocol and communicates with external devices through serial ports. The Modbus RTU protocol is widely recognized throughout the data acquisition industry and is supported by almost all commercial process control programs. Multiple D8000 series modules can be connected to one host computer. A unique and separate serial port is created for each module that is connected. The serial port approach provides instant compatibility with almost all industry standard data acquisition programs that support the Modbus RTU protocol. With the D8000 series modules, anyone familiar with a personal computer can construct a data acquisition system. This approach to data acquisition is very flexible, easy to use and cost effective. The modules can be mixed and matched to fit your application. You do not need engineering experience in complicated data acquisition hardware to build a system. The D8100 through D8400 series analog input modules contain seven differential analog input channels. Each module contains analog signal conditioning circuits that are optimized for a specific signal input type. Signal types include DC voltage, 4 to 20 mA current loops, and eight thermocouple types. Each input channel can be programmed to accept a different signal input range. The sensor signals are converted to digital data with a microprocessor-controlled integrating A/D converter. Offset and gain errors in the analog circuitry are continuously monitored and corrected using microprocessor techniques. The analog input modules communicate the resultant data values as 16-bit unsigned integer numbers that represent a percentage of the full. The modules continuously convert data values at the rate of up to 25 conversions per second and store the latest result in a buffer. The data values are requested by sending a Modbus query to the module. The D8000 series modules will instantly respond by communicating the data values back to the host processor. The D8500 analog output modules contain two 12-bit digital to analog converters (DAC) for generating either voltage or current output signals. The output signal type for each DAC is user-selectable and each DAC is independently controlled via a host computer using the Modbus RTU protocol. Four different analog output ranges are available, two voltage ranges and two current ranges. The D8500 analog output modules contain userselectable features such as programmable output slew rate, a communications watchdog timer and programmable startup signal value. They also include an 8-bit analog to digital converter for analog readback the output signal. The communications watchdog timer can be used to move the analog output signal to a known “safe” condition in the event of a communications failure. The D8710 digital input modules contain 15 individual inputs for monitoring logic levels, contact closures, or other ON/OFF signals in a data acquisition system. Each digital input terminal contains a pull-up biasing resistor allowing for direct connection to a set of contacts. The input terminals can accept signals between ±30 Vdc without damage. The D8720 digital output modules contain 15 individual open-collector transistor outputs for controlling annunciators, lamps, or other devices that require an ON/OFF signal. 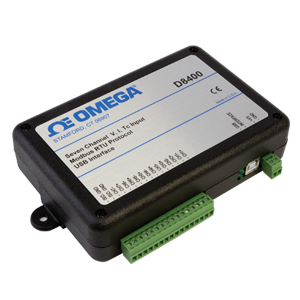 The D8720 digital output modules also contain programmable features such as a communications watchdog timer and programmable startup signal values for each bit. The communications watchdog timer can be used to move the digital output signals to a known “safe” condition in the event of a communications failure. The D8000 series modules are designed to easily interface with computers using a USB interface. The USB interface creates a virtual serial communications port on the host computer. All communications to and from the module, through the virtual serial port are performed using the Modbus RTU protocol. A new serial port is added for each D8000 series module. Modbus RTU protocol is one of the most widely supported serial protocols in the data acquisition market. Modbus RTU software drivers are available for almost every data acquisition software program available today. Thus providing instant connectivity between the D8000 modules and most data acquisition software programs. The D8000 series modules are initialized at the factory using the Modbus RTU protocol. User selectable features such as individual channel range selection and digital filters are easily configured using the D6000/D8000 series utility software. Each D8000 module must be properly configured before installation into a Modbus system. UTILITY SOFTWARE Complimentary Utility Software is included with each module. The software is compatible with Windows operating systems and distributed on CDROM. The Utility Software simplifies configuration of all user selectable options such as device address, baud rate and filtering constants. The latest version of our software is always available on our web site. 注: Comes complete with operator’s manual and utility software on CD and 0.9 m (3') USB interface cable.